This course will provide an overview of important trends in the history of news over the last 500 years. Drawing examples from several European countries, the United Kingdom and the United States, we will discuss changes in the way news was produced, distributed and experienced by people. 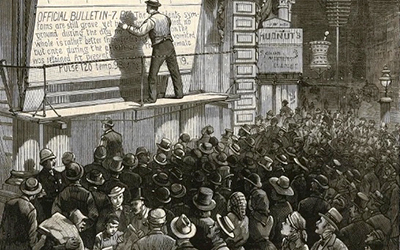 From handwritten newsletters and ballads sung on the street to printed newspapers and telegraphic dispatches; from coffeehouses and reading rooms to radio broadcasts and social media - this Summer Intensive will consider how changes in technology, politics, and culture have transformed the production and circulation of news. Along the way we will examine recurring debates about press freedom, access to information, the proper role of journalists, and the effects of news consumption on individuals and society. At a moment in which misinformation and "fake news" are matters of serious concern, studying the history of news can help us to better understand the stakes of recent changes in the media landscape. Dr Will Slauter received a PhD in history from Princeton University and taught at Columbia University and Florida State University before relocating to France. He currently teaches at Université Paris Diderot and is a member of the Institut universitaire de France. His research interests include the history of authorship and publishing, the history of journalism, and the history of copyright law. He is the author of Who Owns the News? A History of Copyright (Stanford University Press, 2019).